Great offer for Aéropostale customers! Have you already heard about the new sale coupon which allows you to buy any single item from the new collection with 30% discount? It's easy, print the coupon below and enjoy this offer. 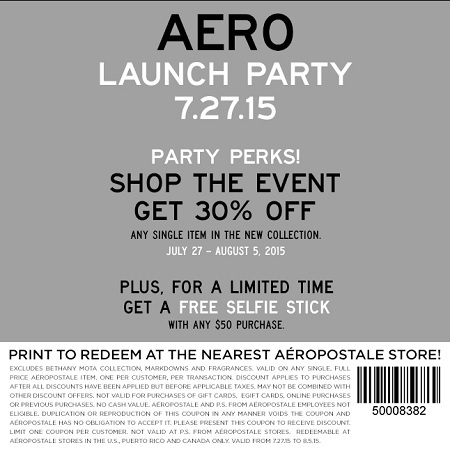 Plus, get a free selfie stick with any $50 purchase (valid for a limited time only). Offer ends 08/05/2015. Official source of the information is Aéropostale Canada. More information about the promotion available at Canadian Aéropostale stores.